My fly-rod has done battle with multiple species. For obvious reasons, trout are definitely on the list, including rainbows, tigers, browns and cutthroats. But so, too, are many others. If I had to venture a guess, I would say that most anglers equate the sport of fly-fishing with the pursuit of various trout species ranging from rainbows to brookies and from cutthroats to the elusive German brown. Given the fly-fishing industry’s focus on the pursuit of trout, it would be hard not to. While purists tend to be trout-centric in their fishing pursuits, there is another side to fly-fishing that opens wide the door of fishing opportunity to those who simply enjoy catching fish, no matter what their species. 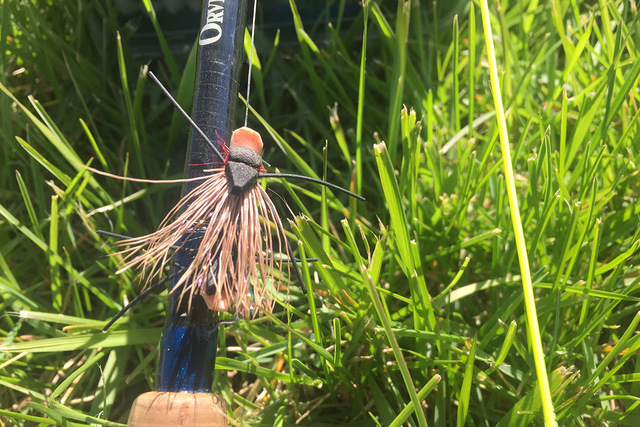 While I appreciate the solid hit a 20-inch rainbow can deliver when mauling a tiny midge pattern, there also is something special about the fight a scrappy smallmouth bass gives an angler holding on to the business end of a six-weight fly-rod. To date, my fly-rod has done battle with multiple species. For obvious reasons, trout are definitely on the list, including rainbows, tigers, browns and cutthroats. But so, too, are many others. Among them are wipers, largemouth bass, smallmouth bass, bluegill, crappie and even carp. I’m still looking forward to catching my first striper on a fly. Noticeably absent from that lengthy list is the lowly catfish, one freshwater species I figured one could never take on a fly. Not on purpose anyway. Then my friend Keith Rogers, a longtime reporter for the Review-Journal, sent me a video that corrected my misconception. On a recent trip to Missouri, Keith and his brothers spent a couple of days fishing and renewing their relationship. One of his brothers has a couple of fish-filled ponds on his 40-acre homestead in the community of Fordland, not far from Springfield. And that is where they went to work, so to speak. The ponds, known as Little Pond and Fish Barrel, are home to largemouth bass, bluegill and catfish. Some of the bass are known to push 5 pounds, but they were not too cooperative on this trip. Rogers started off with scuds and Woolly Buggers, but had no takers. Something that is quite unusual, for a Bugger anyway. Rogers is no fishing slouch. In fact, he wrote a book titled “Freshwater Fishing – The Secrets of Successful Angling.” Using wisdom gained while researching his book, Rogers began searching for anything the fish might be eating and figuring out a way to match it. Suddenly the answer came to him. “Food pellets don’t sink,” he thought. The food pellets Rogers’ brother periodically feeds the fish stay on the surface and gather in the shallows where the fish search them out. And since the pellets float, the fish would be conditioned to look toward the surface. So Rogers dug around in his fly box and came up with a surface fly that had similar coloring to the pellets but also had rubber legs that would attract a fish’s attention. He has no idea what the fly pattern is called. 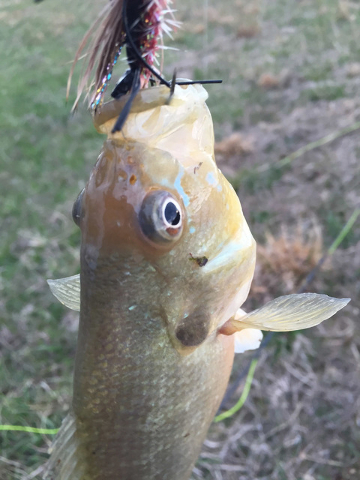 On the first cast, a slab-sized bluegill hammered the no-name fly. On the second cast, a 3- to 4-pound cat came up from the bottom and smashed it. 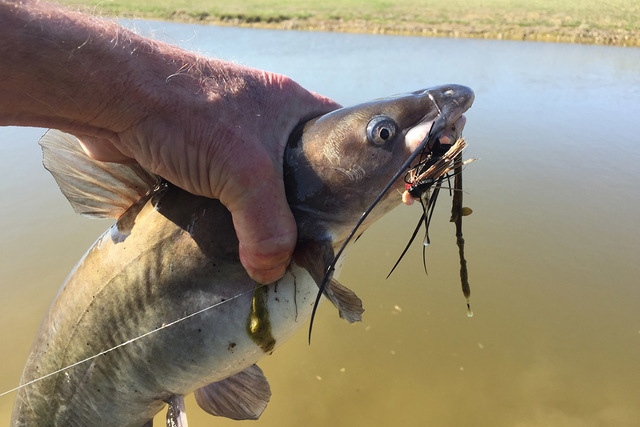 Then, as Rogers worked to remove the hook, the catfish suddenly rolled to one side and snapped his 5-weight Orvis rod in half. Undaunted, Rogers drove to the Bass Pro Shop in Springfield, replaced his fly-rod and went back to the pond. With the no-name fly, Rogers caught and released catfish for three days. The proof is captured on video. “If you know where they’re at, simulate what they are eating and present it to them, then you can catch catfish on a fly-rod,” Rogers said. I guess it also takes a big, ugly fly with no name. Freelance writer Doug Nielsen is a conservation educator for the Nevada Department of Wildlife. His “In the Outdoors” column, published Thursday in the Las Vegas Review-Journal, is not affiliated with or endorsed by the NDOW. Any opinions he states in his column are his own. He can be reached at intheoutdoorslv@gmail.com.